A creation of Japanese copywriter Shigesato Itoi, responsible for many acclaimed works spanning numerous genres, MOTHER was one of the first times an established artist with no previous affiliation with the gaming industry chose the video game as the medium for their latest masterpiece. Both then and now, adventure and role playing games are typically set in a medieval/fantasy setting, or in a futuristic setting. 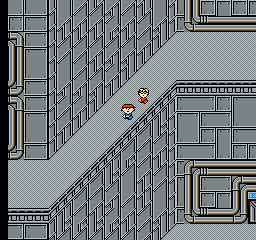 Inspired by Dragon Quest, Itoi paid homage to his inspiration by deliberately breaking many conventions Enix’s early RPGs established as industry standard. Instead of knights and wizards in a fantasy setting, MOTHER featured young children exploring suburban 1980’s America. Visually, the game looked like a cross between Dragon Quest and Peanuts, so much so that Nintendo of America edited some of the games characters to appear less Peanuts-like for the unreleased North American version. 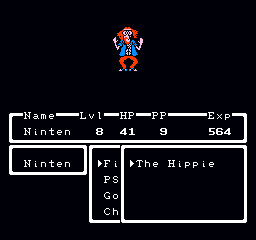 Much of the core gameplay was directly derived from Dragon Quest, but had a distinctly modern flavor. Instead of plundering gold nuggets from defeated monsters, Dad would deposit good old US Dollars into your bank account, which you withdrew with a debit card. Burgers and sports drinks replaced magic potions as restorative items. The swarms of enemies players faced included hippies, crazed automobiles, and escaped zoo animals. Abandoned factories, public schools, and suburban neighborhoods replace the dungeons and walled villages of other RPGs. 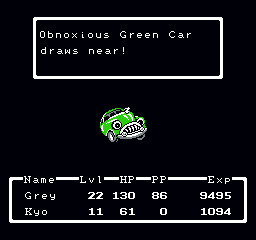 The game's world was gigantic, perhaps even by modern standards, and unlike Final Fantasy or Dragon Quest, in which everything outside dungeons and towns was represented by means of a scaled down “world map”, everything in MOTHER was true to scale, and traversing from location to location was at times a daunting task, even with the help of public transportation. Despite the deliberately simplistic graphics, (even by Famicom standards) the sheer size and uniqueness of the setting won the hearts of players across Japan. When MOTHER was released in 1989 for the Famicom, it gained a following and spawned mangas, CDs, art books, a novelization, and other merchandise. 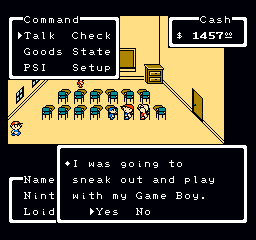 Nintendo of America, and the original designers in Japan collaborated to create a North American version of MOTHER for the NES, which was renamed “EarthBound”. 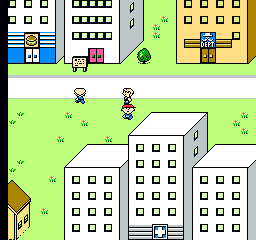 EarthBound was to feature several enhancements left out of the Japanese version, and several prototype cartridges of the completed translation were prepared for review. Oddly enough, despite the unprecedented internal resources that went into Earth Bound’s localization, NOA abandoned plans to manufacture and distribute the finished product, deciding instead to focus on marketing games for their new Super NES. Luckily for English speakers, one of the completed prototype cartridges found it's way into the hands of a group of hackers who turned the cartridge into a ROM file known as “Earth Bound Zero”, which is playable on any computer through an NES emulator. This pirated ROM is the only means by which the game can be played in English unless Nintendo finally gets it’s act together and releases this game legitimately on the Wii’s Virtual Console. For the full, fascinating story of MOTHER and Earth Bound Zero's development history, including an interview with one of the NOA translators who oversaw the project, check out LostLevels.org’s awesome in depth feature, Spotlight: Earth Bound.